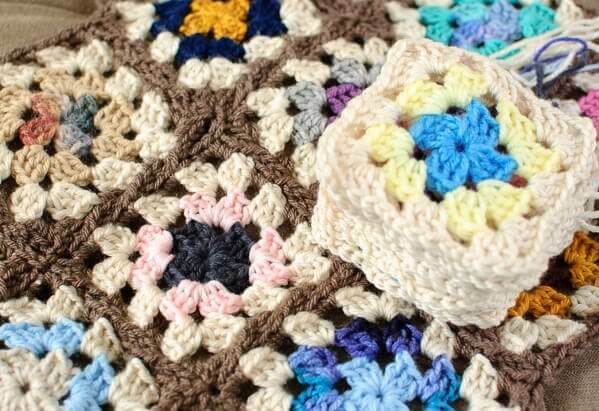 Use up all those leftover balls of yarn you have laying around with a colorful crochet scrapghan! 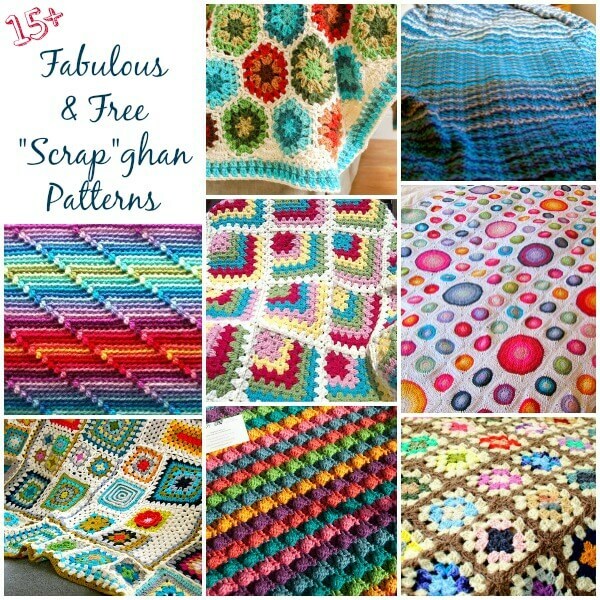 If you are new to the term scrapghan, it is exactly what you are thinking … an afghan made from yarn scraps. and of course, using up all the leftover yarn! There are so many afghan patterns that would work for making a scrapghan. 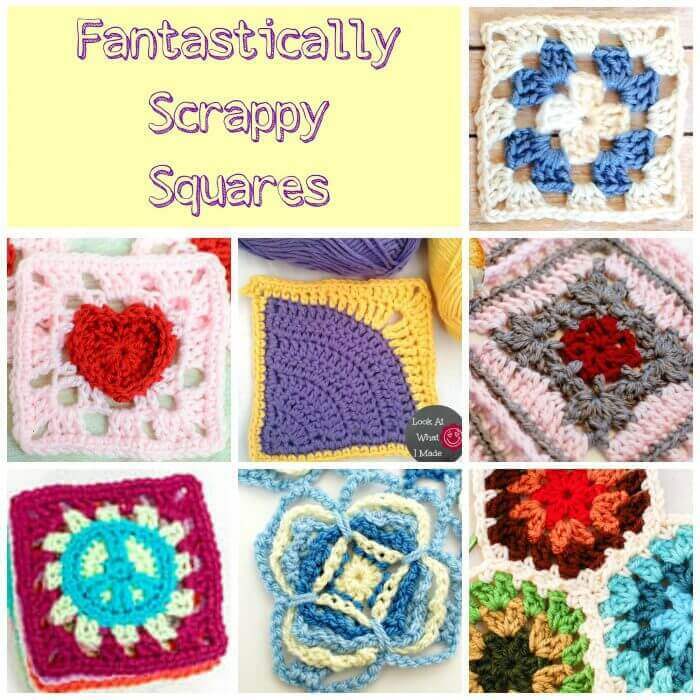 My favorites are of course a granny square blanket or even a granny hexagon blanket. But there are so many options. Just see for yourself in this extensive roundup of stashbusting crochet afghans below. As shown clockwise from top to center: Granny Hexagons, Vintage Wobble Afghan, Happy Colours Blanket, Classic Granny Square Afghan, Blackberry Salad Striped Baby Blanket, Granny Square Sampler, Groovy-ghan, Modern Mitered Granny Square. As shown clockwise from top to center: Classic Granny Square, Motif #105, Granny Hexagon, Motif #22, Peace Sign Granny Square, Heart Granny Square, Iced Pie Square Crochet Pattern. Count me in too. I love scrap quilts and afghans, lots of color and lots to enjoy. I don’t understand drop color A and then start color B in “any 3 chain space” and of coarse again start color C in any 3 chain space. Are you totally cutting the yarn between each row ? And you can start row 2 or 3 at any 3 chain space ? I may be casually late to the party, but I am going to start one too 🙂 I have to find some coordinating colors in my bottomless Bin O Yarn, but I am wanting to make a fun granny square aphgan for a wedding gift for my cousin. I love how this one whips up and I like the idea of it being so portable, so I can work on it anywhere! Thanks for a great idea & pattern! I am in, always got plenty of small balls of yarn. I can’t wait to see what all of you come up with! I consider myself an advanced beginner and have only made a couple of practice granny squares. I have been looking at patterns and considering getting my “granny square” on, so this comes at a really opportune time for me. I would love to do this CAL. Thanks! FYI – on the scissors on the plane issue: I was looking for some cottons today and some stitch markers…. and I found a yarn snipper that is NOT scissors….will be ‘airline approved’. Like a little wheel with ‘notches’ and it snips yarn quite nicely….cost a whopping $1.47 (at Walmart)….it’s made so you can hang it around your neck (I put a length of yarn through it and will be carrying on….harder to lose with that bright green yarn attached! so ! if you’re planning to fly, look for one of these little doodads! I’m definitely in — have several afghans in the works right now, a no beginning chain afghan and a basket weave baby blanket plus I always have some chemo caps in the works. Sounds fun do I need to do anything special? I have not done this kind of project before… but would love to hook along! I’m in never made a scrapgahn so I’m looking forward to this! I am looking forward to it. I have so many scraps to use. I’d like to make a large (king size bed) blanket with a five pointed granny. It will be continuous with variegated yarn. How many skeins would I need? And is there a trick to creating five points? It would look like a star on the bed. Hi Joan 🙂 I am not sure how many you would need for a blanket like that. The idea of this crochet along is to use up the scraps and little balls you have leftover from other projects so we really won’t be talking about yardage. I’m in, I’ll have pictures soon. Count me in on the crochet a long! Sounds like fun and I’ve been trying to get started on an afghan….have done scarves, hats, cuddly animals, etc…and even a couple of pillow covers in living room (LOVE, love, love Attic 24’s “Blooming Pillow” and have done that one…so an afghan it is! Will be flying cross-country in a couple of days, may try to do some work while in the air….have to think ahead, though, since I can’t have my handy scissors to clip yarn and change colors…any suggestions? No scissors! I hadn’t thought of that … do they let you bring nail clippers?? I will be sharing the pattern for the granny blanket I am working on if you want to give that a go. Have a safe trip! Yarn cutter pendant would work i think! Is this something that is simple enough for someone who has never crocheted could do? Sounds Great! have a load of scraps! So excited! Not only do I have lots of leftovers, but I am always buying bags of scraps & skeins at thrift stores. Can’t wait to get started! Count me in, I’m just starting a mixed stitch scrapgahn. I’m in! So excited to have something fun to make with all the scrap yarn piling up in my craft room! I am so in! Sounds like fun! I’m in the middle of a couple of quick baby blankets for charity using up some of my stash right now. I have so many scrap granny squares & granny hexes that are waiting to be put together. I make a bunch, add them to a big ziplock bag, & they wait… I have to decide on my joining color, then I’m in. 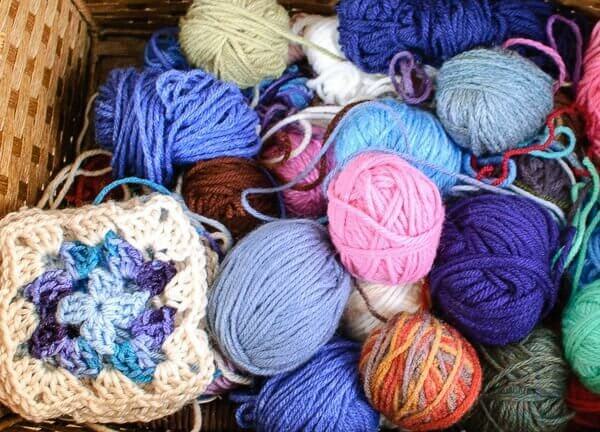 Sounds like a fun idea – I am just about to start granny square project – I am going to make myself a bag. Grannies are the best! That’s great, I’m in!… I’ve just finished a massive blanket, time for another one.